Page Turning Predictions is a new feature I am going to be hosting on this blog, 'A Day Dreamer's World', which will be posted every time a sequel or the next book in a series I am anticipating is published! 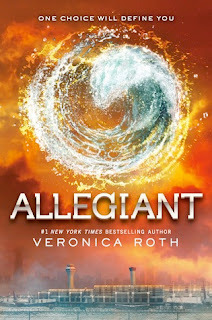 I'd like to point out that there will be spoilers in this post if you have not read the first two books in the Divergent Trilogy yet! The whole series has been building up to our heroine Tris going through the gate and into, who knows what? From this sampler that was released a few weeks ago, and from the build-up throughout the book, I'm almost positive that they will go outside. Of course, at this moment in time only Veronica Roth knows what's out there, but I'm going to guess it's either a completely destroyed world - due to what Edith Prior said at the end of Insurgent - or a new civilisation that is thriving without the fractions. Maybe we will see conflict between them and the people coming from the factions? Or, I'm learning towards conflict about leaving behind the dystopian Chicago - as they will probably all struggle without the control and feeling like they 'belong' to a group of people. I am quite sure, since Tris has fought against being defined as one thing, that there will no longer be a faction system at the end of the book. I think the only thing we can be correct to say is that not all of the characters we love - or hate - will make it to the end of Allegiant. Four and Marcus' relationship will never be the strongest but, I do think Marcus' part of the story is coming to an end. This could leave room for quite a dramatic scene for Four. Caleb - he's probably the character I am most excited to know more about. He's so interesting and complex, and it seems that none of his decisions have made him a 'hero' exactly. There must be a reason for this - and that I'm sure we'll find out. Maybe this is something to do with Jeanine? Although, she was killed by Tori in Insurgent, I feel Caleb could easily be hiding something himself. become split at some point in the book. I think the ending will be them going through the gate together, or maybe this is just too obvious and it will be slightly different. How about the gate being opened for everyone to be free? I know the airport on the US front cover has interested a lot of people; I'm going to take a wild-card on this one and say this is probably something they will find, something that is remaining from the times before they were locked away. Yes, I said it, I think they were locked away and not allowed to go out again. It's clearly more complicated than initially thought. The airport could show an escape from Chicago easily enough, and what I feel could be exploring what remains of the world. I really want to find out whether or not this is populated! Faction-wise, I think the Divergent will be the one's to rebel and Four's mother will end up being the centre of a lot of threats. In my eyes, she is going to try to take-over and become a 'Jeanie' type-figure. 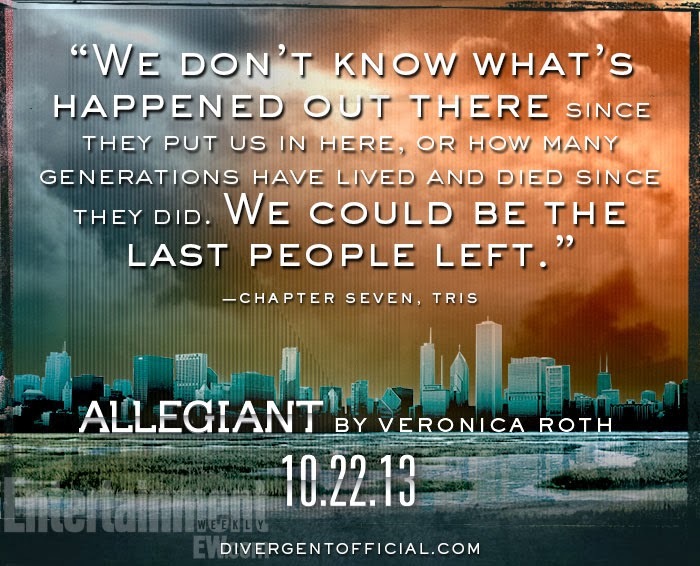 Tris, on the other hand, is certainly going to have a lot of fighting to do in my eyes. I feel like, obviously from the title, she's going to have to decide whether following Four to whatever he believes is the right thing or standing with what she believes in is the right thing to do. The three feathers on the UK cover - three people, or groups to choose from. Marcus, Caleb and Tori won't make it to the end. I feel there will be a lot of conflict in this novel, a lot of family arguments and whatever the secret is, it's going to divide people. 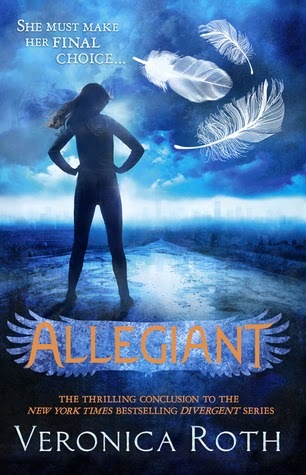 Tris and Four are going to become split at one point in the novel - all to do with Tris finding who she belongs with(allegiance). We're going to meet some new characters but learn a lot about the old one's: Caleb. Tris is going to be hugely affected by what her new relative says and is going to have fight for the truth - again! The airport on the cover shows that they are going to escape. They will make it out of the gate - to discover either a civilised population or something worse than the world they've come from. Everyone will become factionless - there will no longer be a faction system. 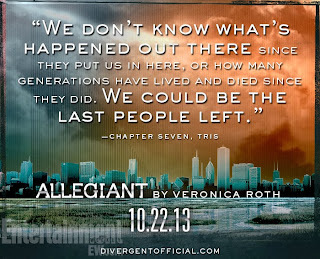 What are you predicting for Allegiant? Oh my gosh, I LOVE this feature! You should consider making it into a meme type of thing - I'd happily take part! Thank you so much, Rachel! I may do, it helped me refresh my memory and was pretty fun to write! I've heard it's really sad so, I hope it doesn't mean Four dies. I will be needing a lot of tissues! I think Caleb is such an interesting character too! Seeing the outside world is such a good point - I'd love to know more about it!